The second last night of Christmas vacation the girls and I headed for Chelsea’s farewell meal. We are grownups now. 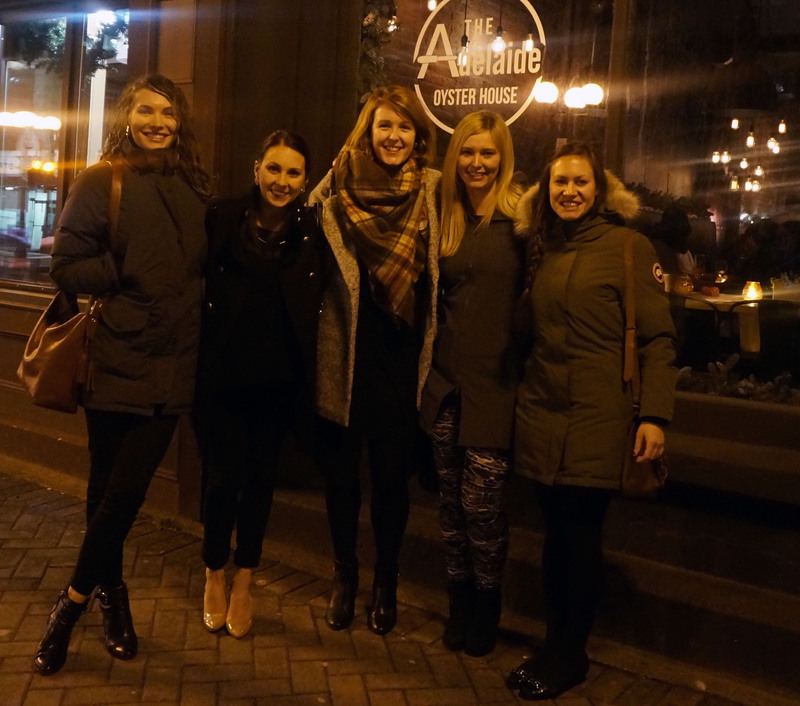 Babies and houses and jobs have spread us across the world —the five of us don’t spend much time together, a couple days a year at most—but when we’re together, we’re 16 again. It’s probably annoying to everyone else, but to us it’s the best thing in the world. 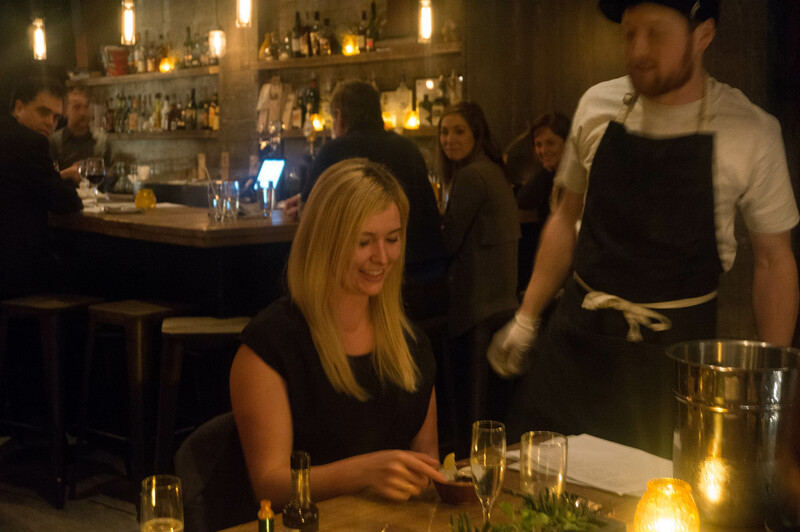 Chelsea, who lives Australia, has a penchant for oysters and it was only natural I experiment with the newest restaurant in downtown St. John’s. Let’s start with the decor. 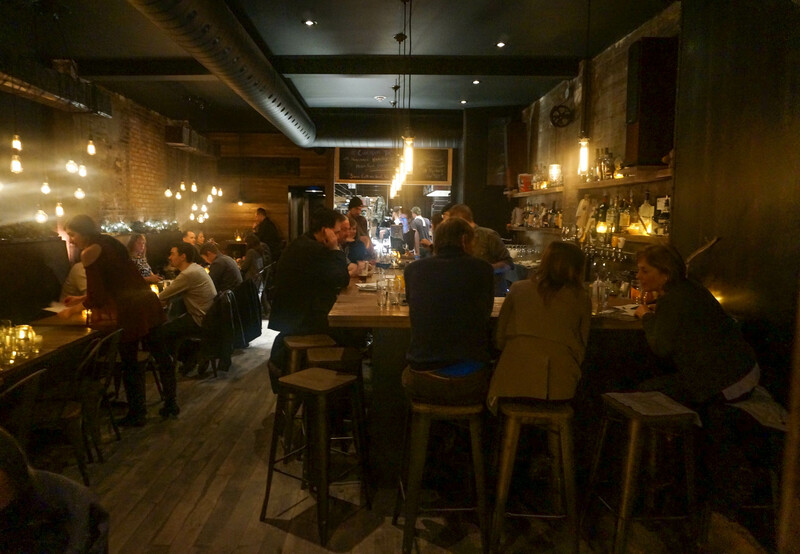 We all know I’m sucker for mood-lighting (Agricola Street Brasserie post from last year) and this place has it in spades. 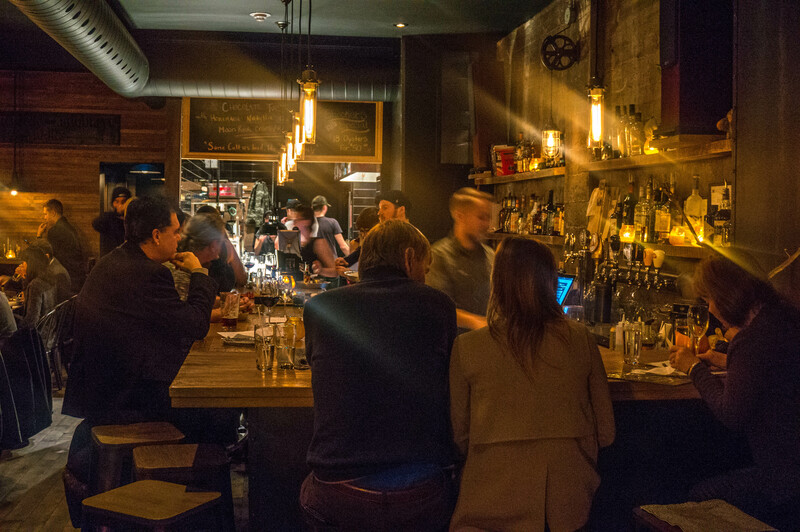 Industrial lighting with filament bulbs casts a comfortable yellow hue over patrons, dark wood and tarnished metal makes the small space contemporary, and the hip playlist is unapologetically loud. The small details are minimalist and modern. This place is cool. 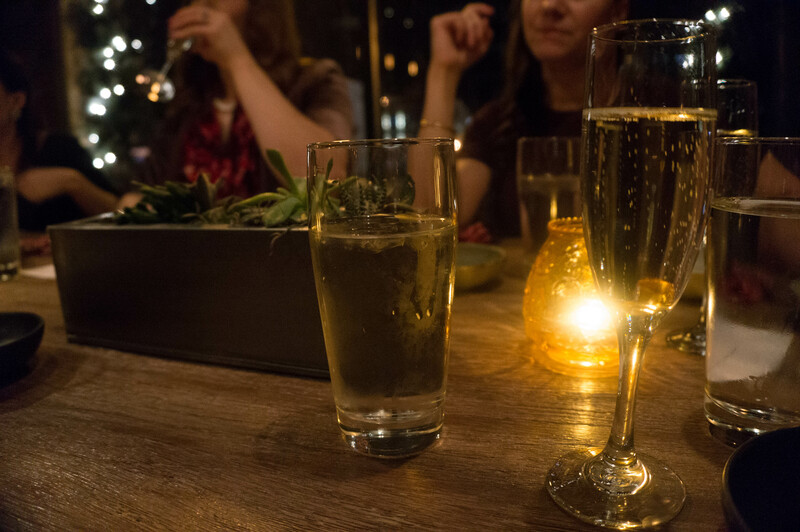 The menu changes daily with a selection of small plates arriving whenever they are ready. The plates alternate like a revolving door with servers constantly bringing new bites to the table. 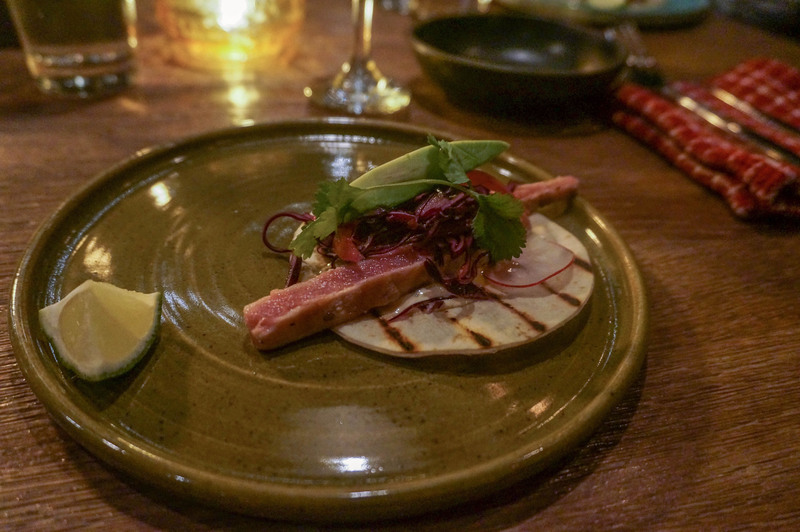 My first dish was the Tuna Taco ($6) with avocado, local cabbage, pickled red onion, cilantro, and baja suace. Delicious. I definitely could have eaten 10 or more, and the girls agreed with me. Big hit at our table. 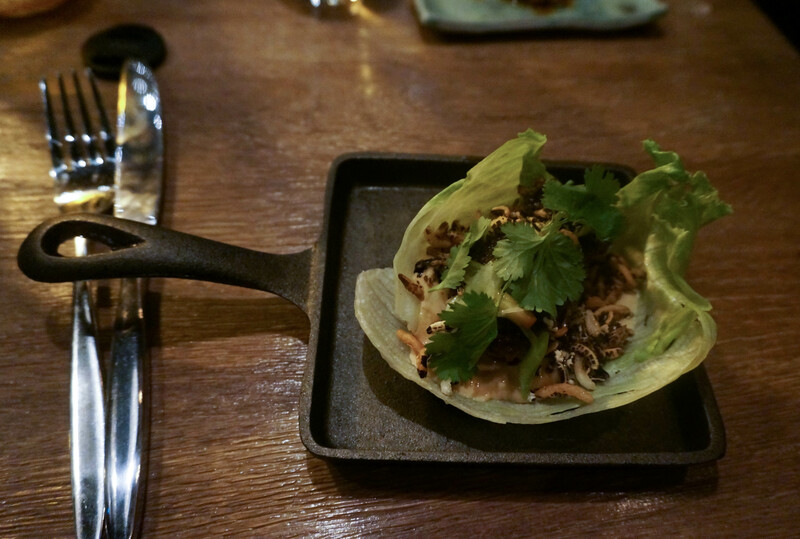 The Kobe Beef Lettuce Wrap ($7) is flavourful with pickled scallions. The toasted wild rice puffs add a great crunch. The food at the oyster house is beautiful. The Composed Beet Salad ($10) was a work of art. 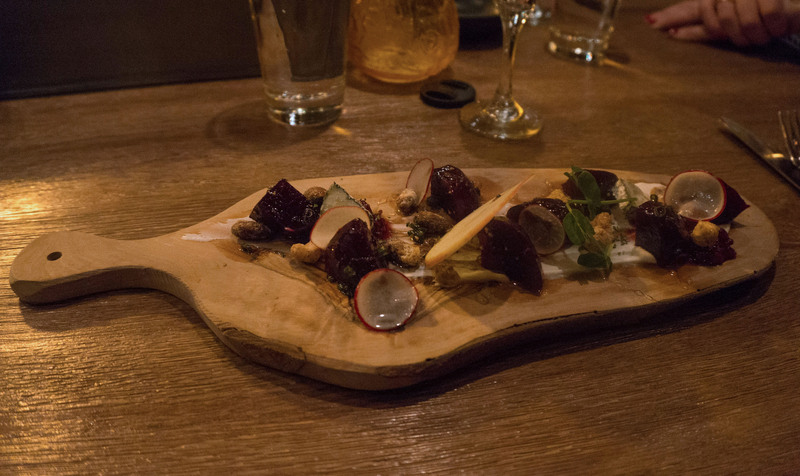 The giant wooden plank was the canvas for ash covered goat cheese and cranberry chutney, while nuts and yoghurt punctuated the plate and the palate. 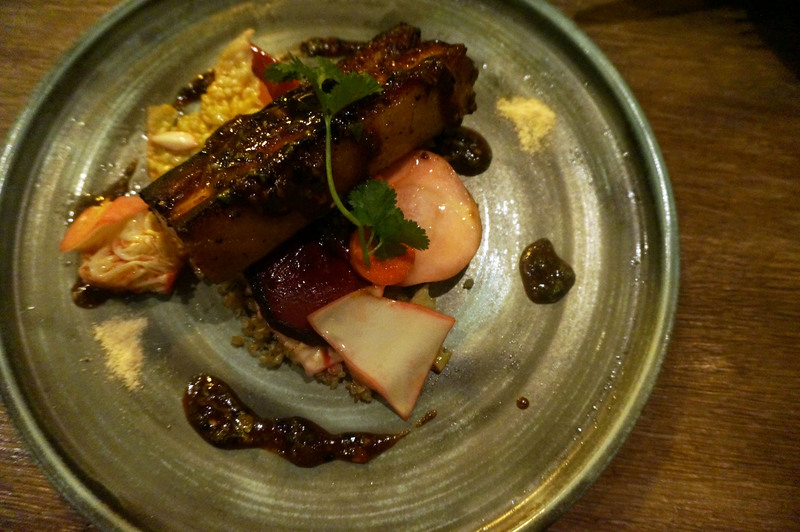 One of my favourite dishes, per usual, was the pork belly. The Thai Style Pork Belly ($16) is one of the bigger and pricier dishes on the menu, but certainly lived up to the description. The sauce was tart with the perfect amount of heat. 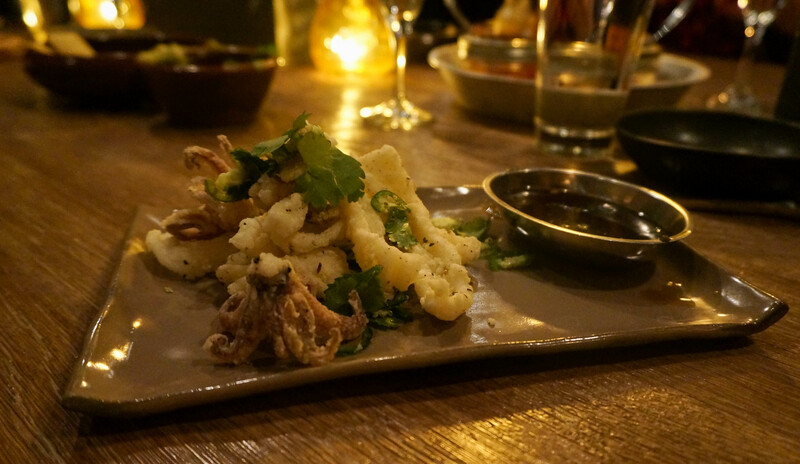 The Salt & Pepper Squid ($9) was also a big hit at the table; there were numerous orders. Simple delicious breading with a great chili-lime sauce, you can’t go wrong. The only gripe I had was with the oysters. 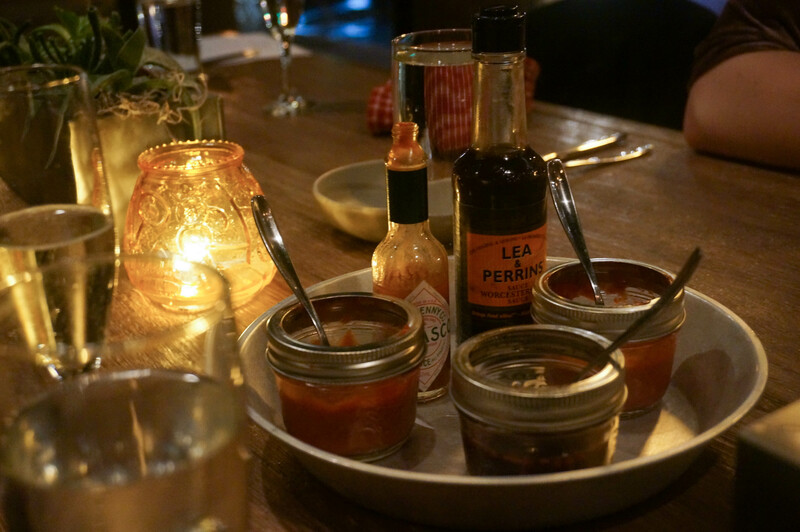 While I understand the methodology of small plates, and I’m completely comfortable grazing over multiple plates throughout the evening —in fact, I love it, St. John’s totally needed a place like this— I didn’t like the fact that the oysters for the table didn’t all arrive at the same time. How many oysters can a shucker shucking shuck in the span of a night? One hell of a lot, there was one person shucking for the whole restaurant. But between the entire table we only ordered 18 oysters, and they arrived at different times, mine actually arrived as the last dish of the evening. I would have liked them to arrive at the same time, mostly because I was left drooling after everyone else’s tasty oysters. Their mignonette is killer, for the record. I did like that the oyster shucker personally delivered the freshly shucked delights to the table and talked about the varietals. Chelsea preferred the fresher, sweeter, west coast oysters, while I preferred the brinier east coasters. Oyster virgins beware: if the staff figure out you’ve never eaten an oyster they are coming at you with an oyster and a chant just like they did with our dear friend Meghan. They make a big deal out of it, and I love it. 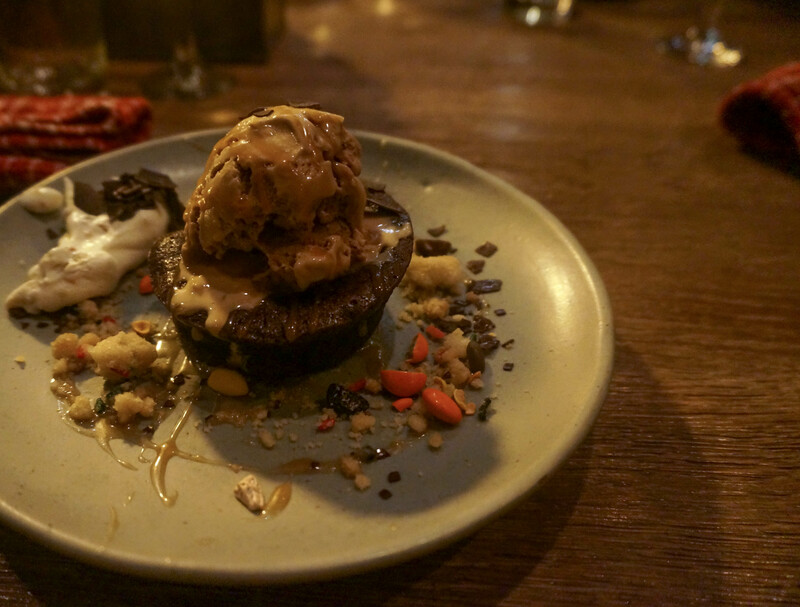 Dessert was delicious, chocolatey, reeese-pieces amazingness. Enough said. 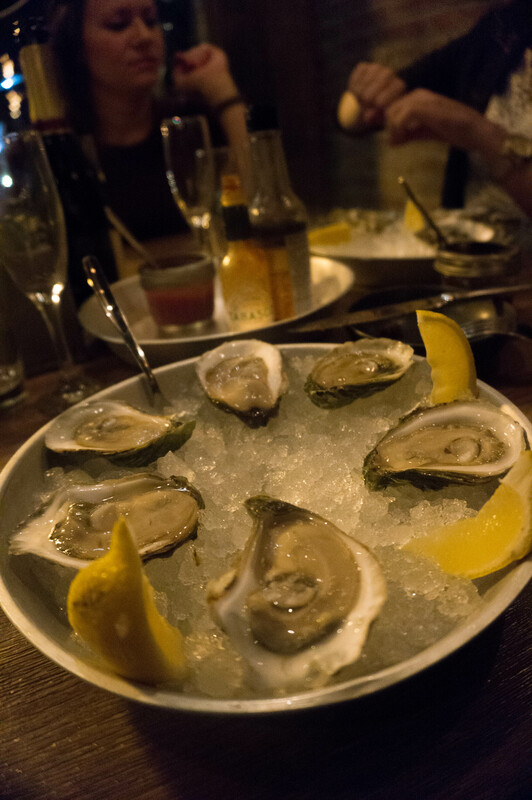 An evening at The Adelaide Oyster House is well spent; Grab a table, have some drinks, and spend the night eating, one delicious plate at a time. Overall, a great night out with the girls, per usual. They are my home, where I laugh the most, and every minute —however few and far between— is always super special. Open Tuesday- Sunday 5pm until close. Wow, this all looks amazing ! You make me want to go!! This is Day 3 of our stay in St John’s & my wife & I have dined at AOH two consecutives nights. Excellent service, fantastic food made with the freshest ingredients. Oh, the flavours!! If I had one complaint it would be about the music volume. Could we maybe turn it down just a little? I give the AOH a 9.5! !